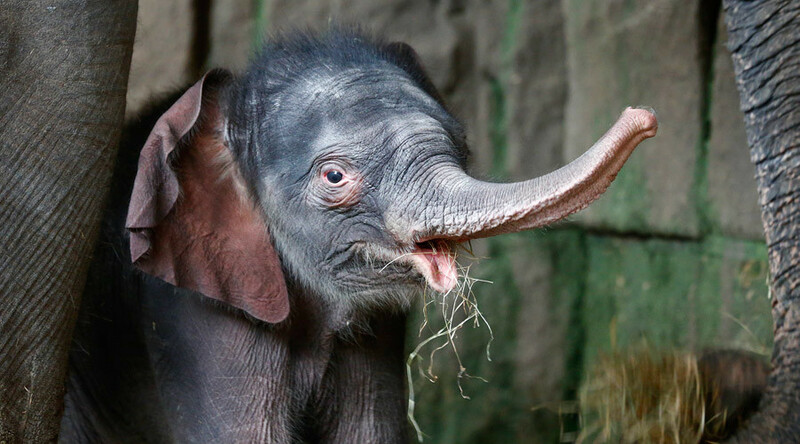 Visitors to Berlin’s Tierpark Zoo got to meet its newest bundle of joy Sunday - a New Year’s baby elephant. The arrival caught staff off guard when he was born three months premature while the humans were celebrating, just after the clock struck midnight. Proud mother Kewa gave birth to the not-yet-named healthy boy without assistance from zoo attendants or vets. He weighed 100kg which is about average for newborn elephants despite the early delivery. Hilariously, zookeepers initially announced him as a baby girl, because up until Sunday, he managed to "do his business completely unobserved", Carer Mario Hammerschmidt told the Local on Monday. Sunday was the first day he appeared in public - an experience witnesses will likely never forget. Before the correct gender was known, Hammerschmidt said the calf is doing fine and is ”very curious and has already made her first contacts with her two older siblings Thuza and Pantha". The baby is the fourth offspring born to his mother, joining a captive 'herd' of six African and seven Asian elephants at the German zoo. Unfortunately, he’ll be raised hundreds of miles away from his father, 32-year-old Ankhor, who was shipped to Prague Zoo in 2014. Maybe he can visit him over the holidays, although he'd need to borrow a suitcase since he only has a little trunk.